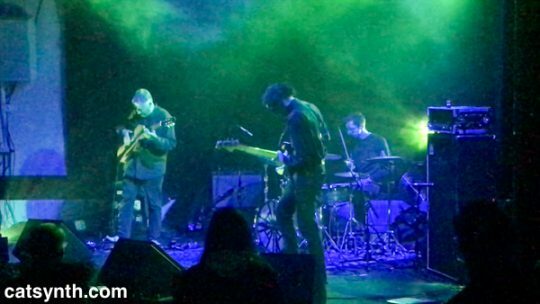 Today we look back at the December show at the Starline Social Club featuring the Fred Frith Trio, IMA, and Watkins / Peacock. It was the subject of a recent episode of CatSynth TV. In addition to giving a great interview, Zachary Watkins performed a great set with collaborator Ross Peacock, featuring a large array of electronic gear, with interesting rhythms, harmonies, and timbres throughout. The largely improvised set included several patterns and patches from Watkins as well as solo work by Peacock on a vintage Korg MS-20. IMA, the duo of Nava Dunkelman and Jeanie Aprille Tang (aka Amma Ateria) provided a very different sound and style combining percussion and electronics. The timbres of Nava Dunkelman’s percussion and Tang’s electronics complement each other, with the electronics weaving between the frequency ranges and timbres of the percussion. This worked especially well with the metallic sounds. Having played together as a unit for a while now, IMA’s improvised sounds have a tight structure and narrative quality. Then it was time for the Fred Frith Trio to take the stage. In addition to Frith, the trio features Jason Hoopes on bass and Jordan Glenn on drums. Like IMA, the trio locked in even in more free-form improvised sections to maintain a rhythmic and virtuosic quality. They have developed a musical language among the three of them that allows them to converse and also listen during “monologues”, like Frith’s solos or Hoopes’ dramatic bass patterns. We had a great time at this show – the Starline is a good place to see live music. The stage lighting was almost a performer in its own right, constantly changing and adapting to the music. The fog could have been a bit lighter, though. We continue to catch up on the many concerts we have enjoyed this year. Today we look at an intriguing performance by the San Francisco Contemporary Music Players featuring Peter Evans’s Lover’s War and Igor Stravinsky’s L’Histoire du Soldat. While the Stravinsky is dark and pessimistic even while it is fun, Evans’ work combined with Baldwin’s words is more optimistic. And about a century separates the two compositions. Nonetheless, they work surprising well interleaved this way. Both pieces have a very fragmented nature, and the contrasting moods help rather than hinder. In Evans’ program notes, he described his work as contrasting rather than responding to Stravinsky, and we think this is an apt description of how the concert unfolded. But it did feel like it melded in a way into something new; and the musicians, both SFCMP regulars and guest performs had a lot to do with that. Overall, it was a fine evening of music at the Herbst Theatre in San Francisco. And we enjoyed talking with performers and others at the reception afterwards. We at CatSynth look forward to continued experiments from SFCMP. Today we look back at the 2016 San Francisco Electronic Music Festival, which concluded two weeks ago. The opening night took place at the Kanbar Forum of Exploratorium here in San Francisco. The large rounded space featured an immersive multichannel speaker system designed by Meyer Sound, and both acts that day took full advantage of this. 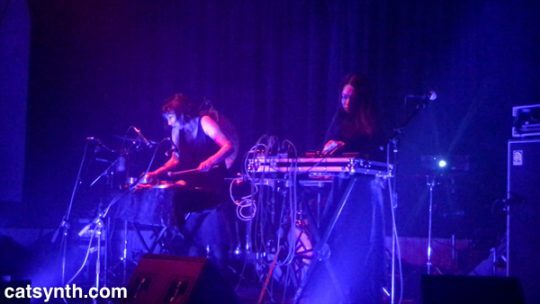 The evening opened with a set by IMA, the electro-­percussion duo of Nava Dunkelman and Jeanie Aprille Tang (aka Amma Ateria). 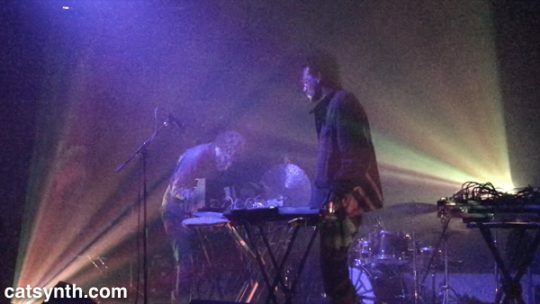 They performed with an array of percussion instruments and live interactive electronics. Their sounds range from quite sparse to large clouds, often mixing in bits of vocals with the heavily metallic percussion. For this set, they played with space as well, spinning sounds around the room using the speaker array. There were moments when the individual sounds could be heard as a single point in space, others that were on the edge of a noise wall. I also appreciate that their sets are quite embodied, not simply standing on stage behind their gear but moving around as the sound and space suggest. The second set featured Conrad Schnitzler’s Cassette CONcert, performed by New York musician Gen Ken Montgomery. Cassette CONcerts are boxed sets of cassettes that Schnitzler composed with the intent that others could perform and listen without his presence. Montgomery has become a primary interpreter of these pieces, “conducting” the eight-channel work on a variety of speaker systems. It fit quite well in the space, which was darkened except for projections on the main screen. In many ways is the opposite of IMA’s set, completely disembodied, with long stretches of sound, and made from pre-recorded materials. One could even call it sculptural or a sonic painting. But it fit quite well in the context of the SFEMF concert and was a fitting second act to this first night. Overall, it was a good start to this year’s festival, and a more casual setting ahead of the next three concerts to come. We will have more to share on those in an upcoming article. As happens every year approximately one month before the Outsound New Music Summit, we gathered for the annual benefit dinner. This year the dinner took place at the Finnish Kaleva Hall in Berkeley, a location steeped in history of its own. There was a good company, delicious food provided by Slippery Fish Catering, and a performance by Nava Dunkelman and Jordan Glenn. Both Dunkelman and Glenn and accomplished percussionists in the local music scene, but this was the first time they performed together as a duo. And the result was an exceptional performance filled with a variety of textures ranging from subtle to angry and aggressive. There were moments where the individual materials and timbres stood out in stark isolation, and others where the two worked together to form repeating rhythmic patterns (one might even say a “beat”). The two have contrasting styles that they brought from their other projects (I most often see Jorden Glenn as a drummer for bands, and Nava Dunkelman as a collaborator in improvised duos). Overall, a great evening of music, food and friends. There were many familiar faces among Outsound’s supporters at the event, but also newcomers, which is always good to see. Now it is on to the Summit itself, which begins on Sunday, July 26 at the Community Music Center in San Francisco. Please visit Outsound New Music Summit website for a full roster of performances and events, information and tickets, and more on how to support the continuation of new and adventurous music in our community!